Three generations of the Salvestrin family have been growing wine grapes on our historic St. Helena vineyard since 1932. The vineyard was originally planted by Dr. George Belden Crane in 1860. We produce approximately 4,500 cases of wine each year, including Cabernet Sauvignon, Sauvignon Blanc and a beautiful red blend called Retaggio. Rich Salvestrin is our farmer and winemaker, and he lives on the property with his wife, Shannon, and their three daughters. We often conduct wine tastings on our outdoor patio, but we also have a beautiful indoor tasting room. We offer two tasting experiences, including our Legacy Tasting ($25 per person) and our Crane Estate Tasting ($45 per person). 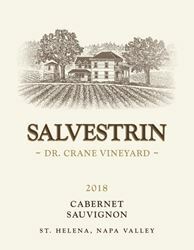 To join the wine club, visit www.salvestrinwinery.com or call 707-963-5105. We have a wine club for each of our wines! Choose your favorite and we will set aside 6 or 12 bottles once per year prior to releasing the wine to the public. Complimentary "Harvest" tasting for Napa County residents. Salvestrin is certified under the Napa Green Winery Program by the Napa County Department of Environmental Management (DEM) and the Association of Bay Area Government’s (ABAG) Green Business Program and completed all the regulatory components needed for environmental sustainability. These components included developing water and energy conservation methods, preventing pollution, and reducing solid waste. In addition to developing sustainable winery practices, this program is set to become the standard for the state of California. Salvestrin is certified under the Napa Green Certified Land Program. Salvestrin has created and implemented a customized farm plan with measured results that addressed all aspects of its property, vineyard land as well as non-farmed land, including practicing soil conservation, water conservation, stable drainage, riparian corridor enhancement, fisheries and wildlife habitat enhancement and long-term improvement and sustainability.